Sherwood Dental practices “dentistry for people who love to smile.” Drs. Stephen Gaines and Arti Patel not only maintain smiles our patients love to show off, but they have also designed an office that supports a patient experience worth smiling about. Drs. Gaines and Patel have created a comfortable, pleasant experience with techniques and technologies that allow dental procedures to be completed in a minimally-invasive manner. Root canal therapy in Oakville, ON at Sherwood Dental uses advanced technology and gentle, precision approaches to preserve a maximum amount of tooth structure. The dental team works with you to avoid the damage that results in the need for restorative treatment; Sherwood Dental knows that gentle and conservative root canal therapy in Oakville, ON may be the only way to retain a tooth. Modern dentistry allows for the creation of teeth that are designed to look and function just like natural teeth, but there is still nothing quite like the “real thing” in terms of exceptional form and feel. 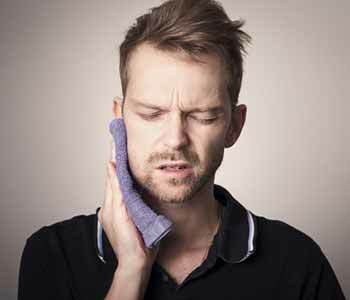 What makes root canal therapy in Oakville different? The World Congress of Minimally Invasive Dentistry, of which Dr. Gaines is a founding member and Fellow, defines MID as supporting those techniques that respect the health, function, and aesthetics of oral tissues. Additionally, these techniques must prevent disease from arising or intercept disease progress with minimal loss of tissue. Endodontics refers to services that prevent, diagnose, and treat conditions associated with the dental pulp. The pulp is the innermost part of the tooth. It’s soft and contains blood vessels, nerves, cells, and connective tissue. Your tooth gets its nourishment from the pulp. The pulp helps you to recognize the temperature of foods and beverages. Think of the pulp as the “building block” for the hard structures of your tooth. It aids in protecting your tooth by providing sensation when there is a problem, like decay or damage from a cavity. Under the gumline, the pulp’s narrow canals that travel into the roots of your teeth may become inflamed or infected. Root canal therapy generally involves removing the pulp, and cleaning, disinfecting, and shaping the root canals. The infection is resolved, the tooth is healed, and the treatment area is filled and sealed to prevent re-infection. 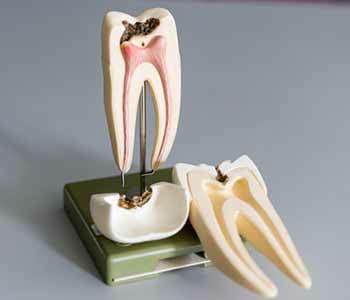 Usually, the final step in the process is placing a beautiful new crown to restore the damaged tooth structure. Within the past 15 to 20 years, there has been significant progress in endodontics. Treatments have never been safer, and more accurate and efficient. Sherwood Dental is practicing today what researchers have hailed as the “future of the dental practice” – Minimally Invasive Endodontics. MIE relies on accurate diagnosis. Diagnostic testing pinpoints the actual status of the dental pulp, so we can determine the least invasive treatment to preserve or restore your health. Sherwood Dental’s extensive knowledge of anatomical structures and variations further supports the preservation of sound tooth structure, as does our approach to techniques and materials that minimize the amount of structure removed for the crown. Your dentists take great care when crafting openings to access the treatment area, so that maximum tooth structure is preserved. Drs. Gaines and Patel have carefully selected dental instruments, products, and technologies that aid in minimally invasive dentistry. Lasers may be used for many dental procedures, including root canals. WaterLase opens the tooth’s surface to access the root canal. A mixture of air and water spray with laser energy, WaterLase aids in gently, precisely, and quickly removing diseased tissues, and cleaning and shaping canals. Lasers generally target infected material and bacteria with greater accuracy while maintaining healthier tooth structure. Laser dentistry is also associated with enhanced comfort, eliminating the anxiety-producing sound and sensation of the dental drill, and the need for local anesthesia. Many Sherwood Dental patients experience less bleeding during root canal and other surgical procedures, as well as reduced post-operative discomfort, and risks of other complications (such as re-infection). Experience tomorrow’s dentistry today. You can enjoy the beauty, health, and function of your treated tooth for many years to come. Minimal removal of original tissues enhances the long-term survivability of your tooth. Likewise, the prevention and management of pulp-related conditions is at the heart of minimally invasive and conservative dentistry. Call 844-951-8855 to schedule your consultation with Drs. Gaines or Patel at the Sherwood Dental office in Oakville, ON.